I'm trying to get Matt and I out of our potatoes as a side dish rut, especially when we are having something like roast chicken. We always forget how much we love the orange vegetables, squash and sweet potatoes. This side dish was inspired by a salad we saw in the deli case at our local grocery store. It is super simple to make with very few ingredients. But oh, do those ingredients pack a punch, sweet, spicy and salty with that special gorgonzola funk. Looking for a different side for Thanksgiving, this one would be perfect. You could have the squash all prepared in the oil and maple syrup ahead of time and just roast it while the turkey is resting. 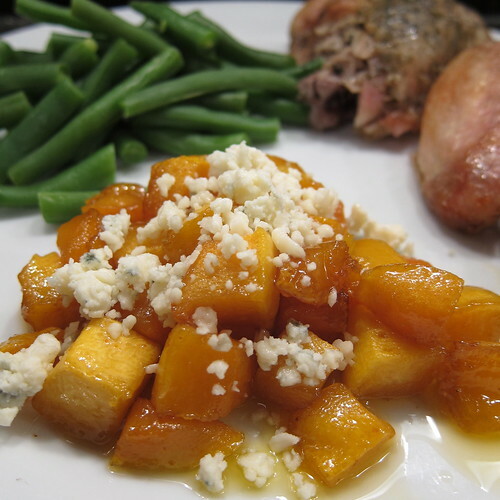 I also think this preparation would be great with sweet potatoes instead of squash. Put the squash in a small roasting pan. Add enough olive oil to just coat them. Stir in the syrup and cayenne. Roast for 30 - 40 minutes until the squash is browned and soft. Serve topped with the gorgonzola. It sounds so good! Hmmm - I have some sweet potatoes! I love the pairing of the cheese with this! for me, this is perfect...minus the gorgonzola. i do love the hit of cayenne--nice touch!